I am the proud mama of a mischievous, cuckoo, smart and loving 5 year old boy. I sometimes have a hard time describing my little Turtle. One moment he will be curled up in my arms saying “Snuggies Mommy?” and the next moment he could be launching himself off the ottoman trying to see how high/far he can jump. Turtle has big emotions and feels them with all of his heart and his whole body– whether the feelings are love, sadness, anger or silliness. He’s also very intuitive of other people’s emotions and is quick to feel the way other people feel. He’s the first person to notice if I’m feeling blue, but is also equally quick on picking up on another child’s manic energy. Sometimes I feel like there isn’t a middle ground with my boy, one moment my heart will be overflowing because he will do something silly and sweet like grab my hand, look into my eyes and say “Hey gorgeous, I adore you with all of my heart!” and the next moment I’m wanting to rip my hair out because he’s thrown himself on the ground and is screaming because he thinks that his sister got a bigger piece of cookie than he did! My Turtle keeps me on my toes and is definitely filled with a silly and mischievous nature… kind of like a leprechaun. The shirts that I make for Hello Creative Family are for Bean, because she’s a bit more predictable when it comes to sitting for a photo shoot, but a St. Patrick’s Day shirt seemed so fitting for my mischievous little leprechaun. 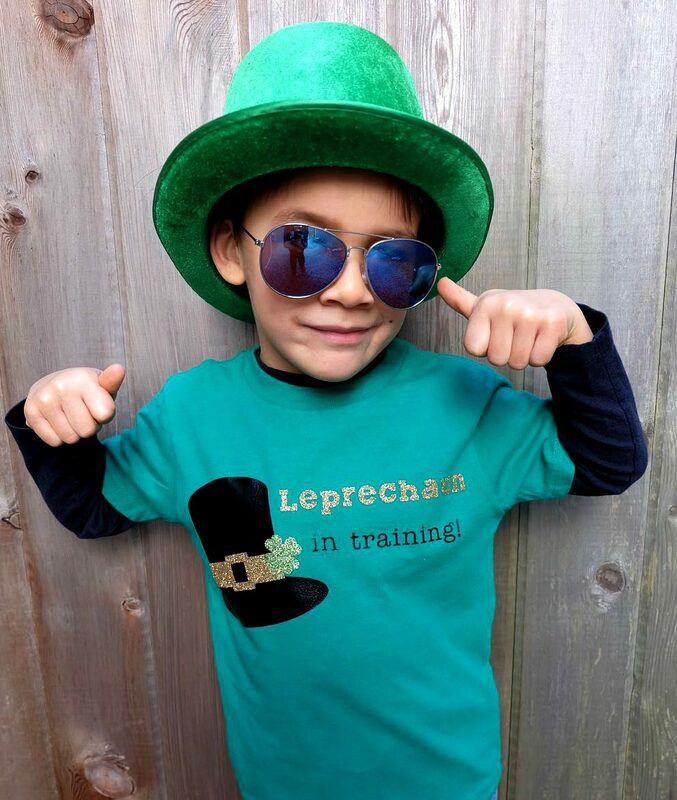 I decided on the saying “Leprechaun In Training” for this month’s shirt, thinking of all you parents who are raising mischievous kiddos like I am! Read on for my instructions and the cut file to make this DIY St. Patrick’s Day Shirt! This is one of my very favorite questions that people ask me about the Cricut. 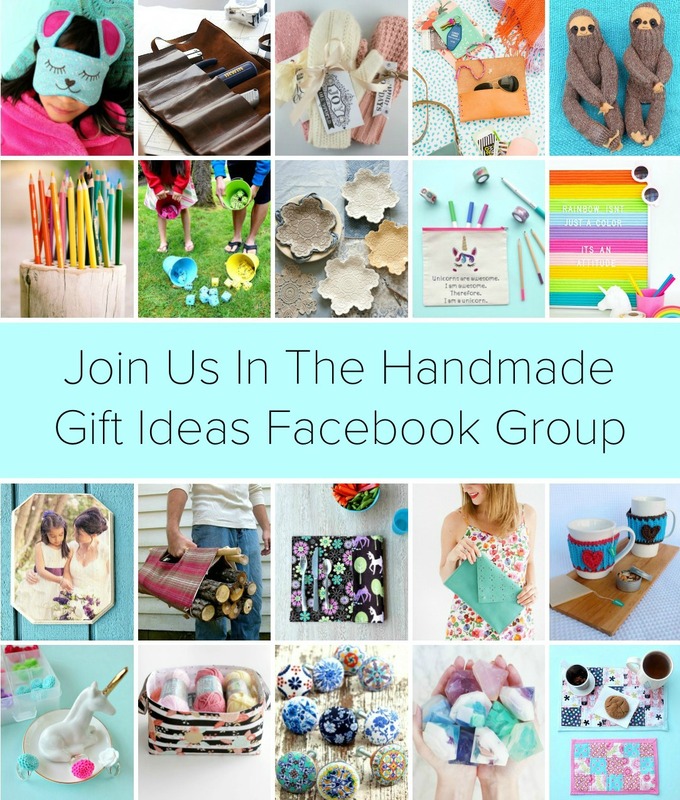 In my opinion, if you love to craft that your craft room is not complete without one! 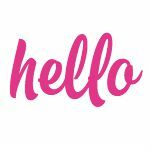 I use my Cricut on a weekly basis which is more than I use any of my other craft supplies/items. I think it also has the widest range of use of anything in my craft room. I have used my Cricut to make children’s and adult clothes, planner stickers, planner stencils, planner folders, wedding bouquets, Christmas ornaments, advent calendars, pillows, jewelry, stencils, laptop decals, iphone decals, tote bags gift tags, signs, wall murals, purses, hostess gifts, party decor, birthday party favors, paper crafts, home decor items and much more! 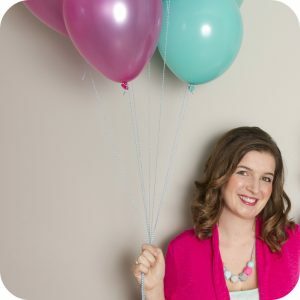 You can see some of those Cricut projects here. I often tell my mom friends that even if they just used the machine to make their family shirts that the Cricut would be well worth the price of purchase. Not only have I saved a ton of money by making DIY versions of things that I would buy at the store, but I’ve also been able to make things for myself, family and friends that are 100% customized and personalized. My kids love going to school wearing a shirt that no one else has, that we made ourselves. 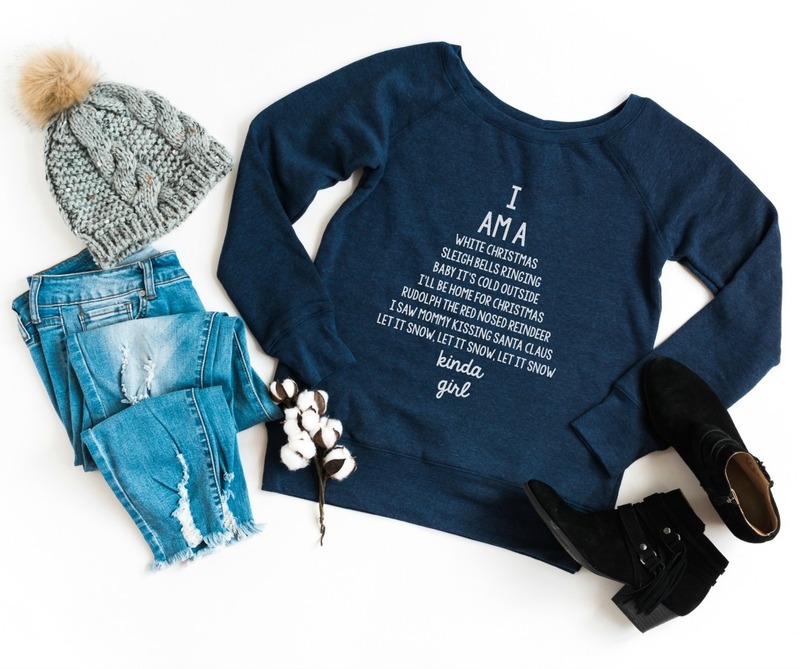 They have told me before “It’s like I’m wearing a little bit of your love to school with me.” My 8 year old sits down at the computer with me on a regular basis and designs her own shirts. I think being able to take an idea that you have in your head and easily create it using the Cricut is priceless. 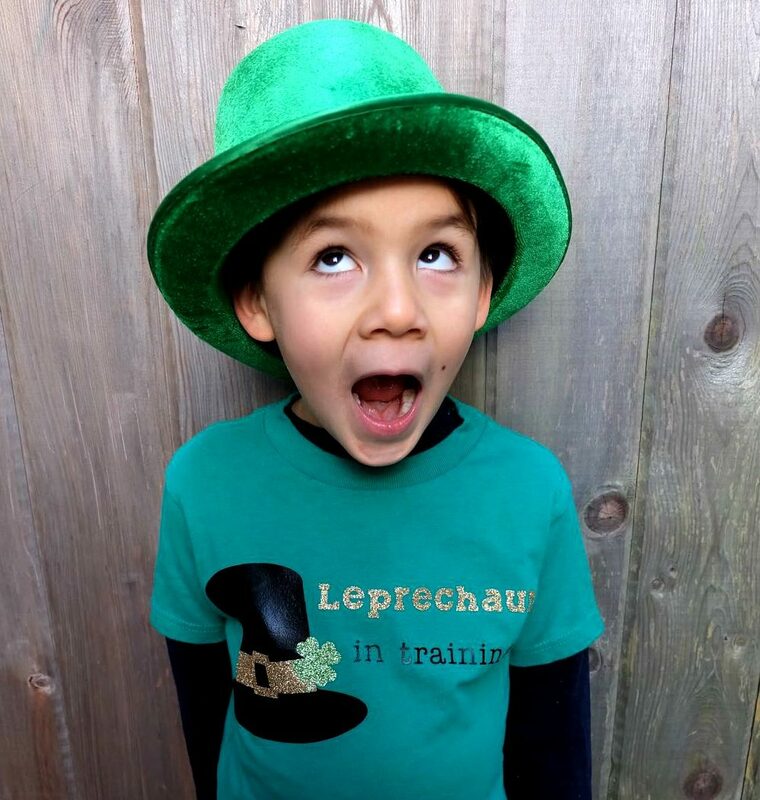 Step 1: Open my Leprechaun In Training Design File in Cricut Design Space, size the design to the size that you would like it for your shirt. Hint: In the left hand tool bar click “Set Canvas” then select Classic T-shirts. Then in the toolbar on the top right click “Canvas” and then select the size of t-shirt that you are designing for and the color. Then you can play with the size and the colors of the design that you are working on. Step 2: Click the round green Go button. You will then be brought to the cut menu. 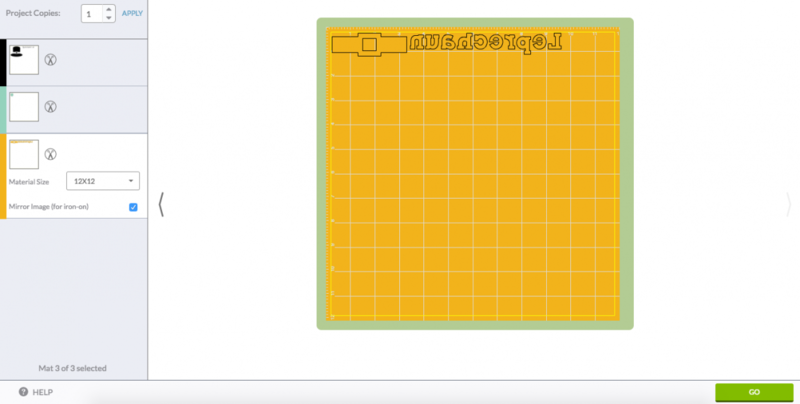 Make sure to click the “Mirror Image for Iron On” box on in the preview box for each color of iron on that you are cutting so that your image cuts in reverse (you want to do this since the Cricut cuts iron on with the front facing part facing down). Set your Cricut dial to iron on. Follow the prompts on the screen to cut your vinyl. Step 3: Weed away the “negative” part of the design that won’t be used on your shirt, and then iron it on your shirt according to the instructions for your Iron On Material. Voila! 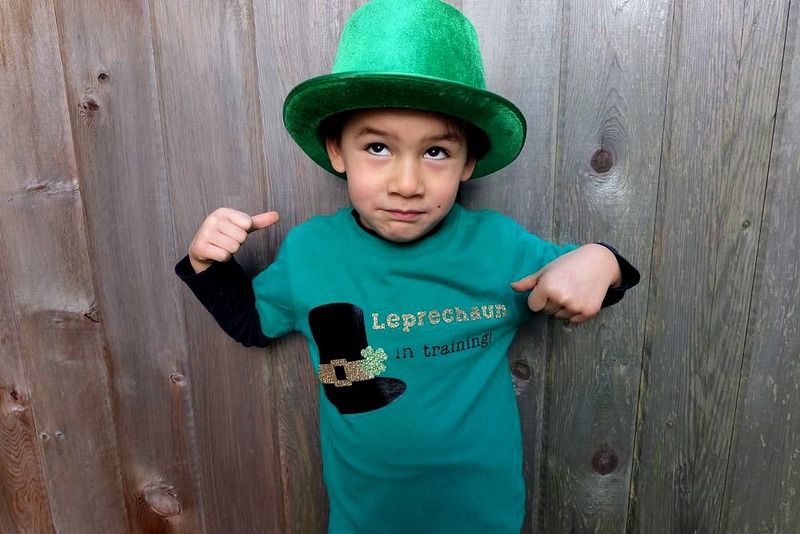 You have an adorable shirt, perfect for your “Leprechaun in Training” to wear on St. Patrick’s Day! 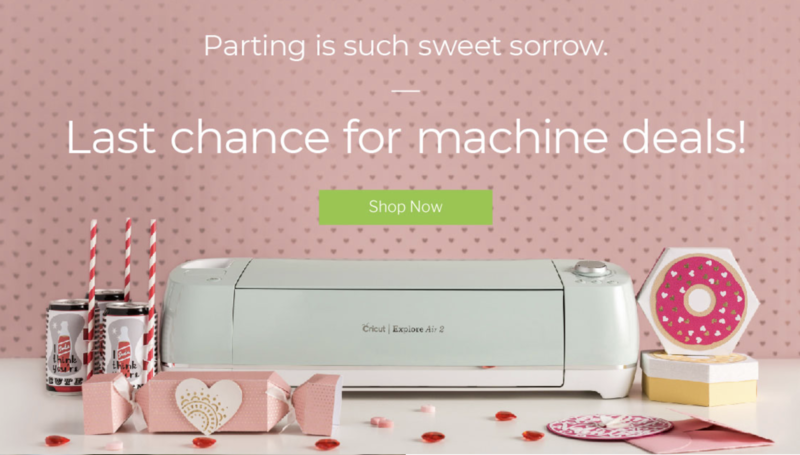 Tell me… Do you own a Cricut? If so, what do you use your Cricut for the most? If not, what would be the first thing you would make if you had a Cricut? Like this post? 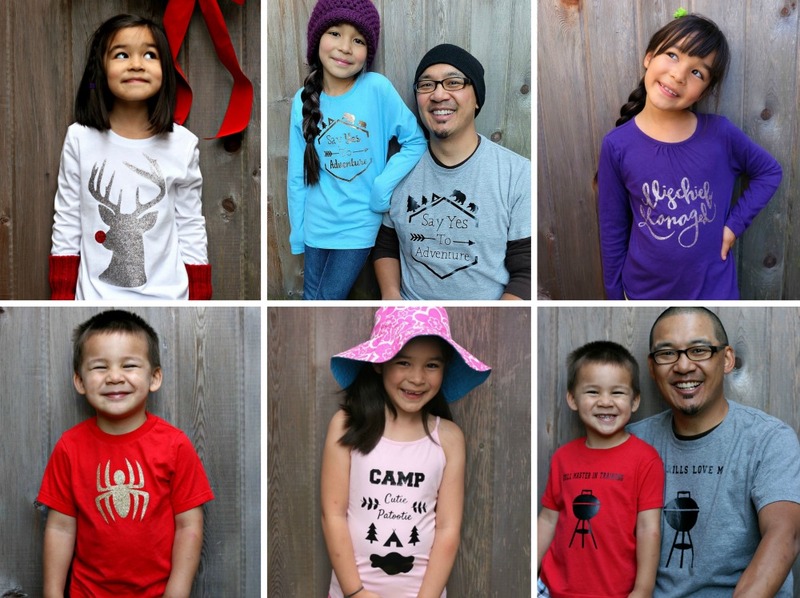 Make sure to check out our other Cricut shirt designs! This is so cute! 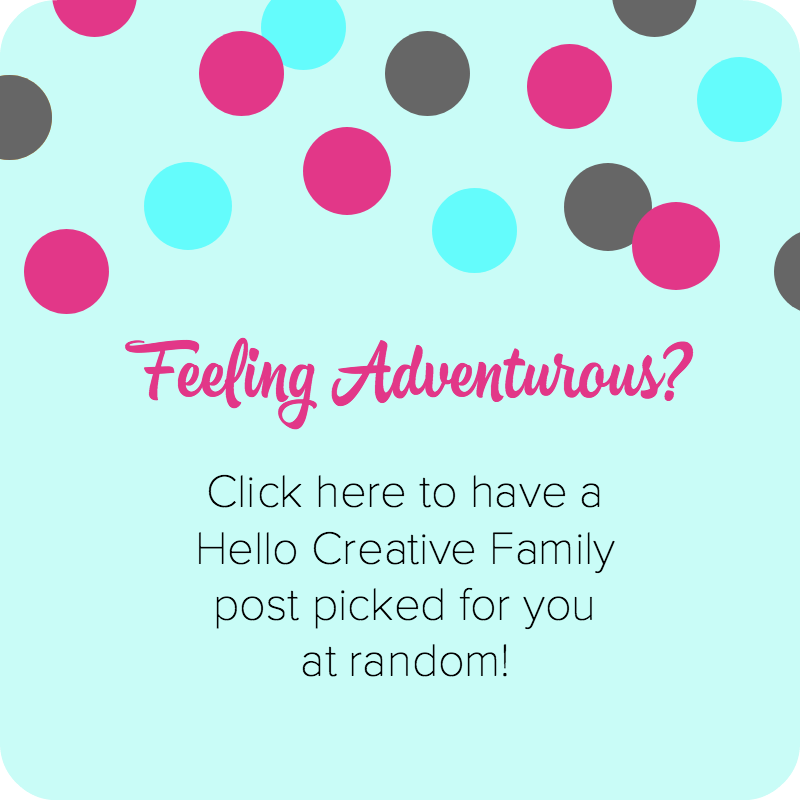 Thanks for linking up to #HomeMattersParty I’m pinning and sharing! This t-shirt is adorable, this is perfect for my son. I will be featuring this in my DIY St. Patrick’s Day Ideas in the Merry Monday Party on Sunday at 6pm PST. I hope you can join the party. 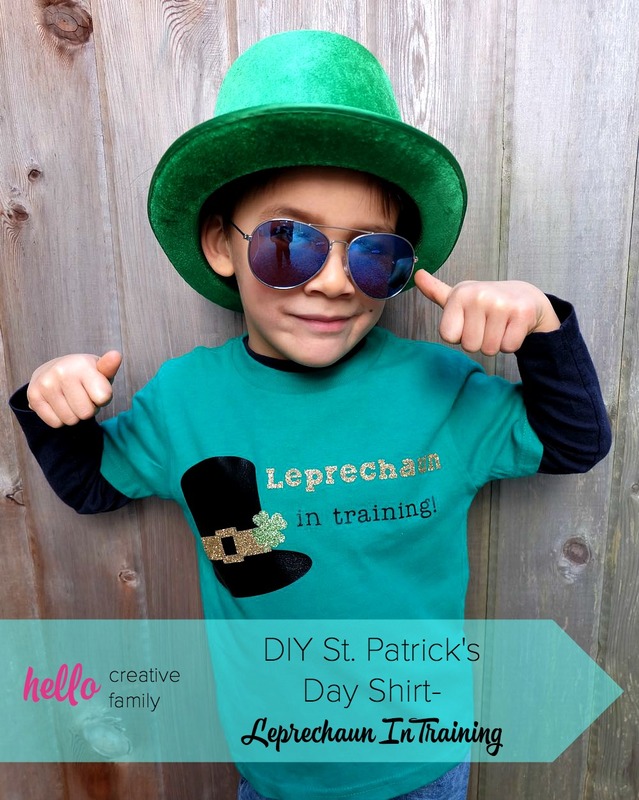 Thanks for sharing your St. Patrick’s Day shirt tutorial on Merry Monday. I love the shirt, but I love the fun faces you son is making for the pictures more…so cute.